James Gunn’s Guardians of the Galaxy is one of those movies that suffers from being overhyped. Call it “hype backlash” or whatever, but for a film boasting a poster with a tagline reading “You’re Welcome”, and the word of mouth currently circulating, I was hoping for something that broke the mold more than it did. And what it did wasn’t exactly breaking the mold, so much as…reshaping it? Iron Man 3 made a bigger impression. And that’s not to say the film is bad—it isn’t. Nowhere near it. The movie was good, and a fun time. Heck, I saw it twice and only got somewhat bored during the third act. But for what many assumed (and claim) to be Marvel’s best, I was just let down, is all. Abducted from Earth as a child in the 80’s, Peter Quill (Chris Pratt) (also apparently known as “Star Lord”) has grown into a womanizing vagabond of a man who comes across an ancient artifact (this Marvel movie’s obligatory MacGuffin) we soon learn is an “Infinity Stone”—a powerful gem capable of planetary destruction. After betraying some old “friends” (led by Michael Rooker’s Yondu), a bounty is put on Quill’s head; this making him the latest target of bounty hunters Rocket—a genetically-modified raccoon (voiced by Bradley Cooper)—and Groot—a sentient tree whose vocabulary is limited to, as Rocket puts it, “I. Am. And, Groot—exclusively in that order” (suffice to say, voice actor Vin Diesel had it made). Things are complicated when Quill (who possesses the Infinity Stone) also becomes the target of super-assassin Gamora (Zoe Saldana), the seemingly loyal daughter of the titan, Thanos (Josh Brolin). Gamora is on loan along with her sister, Nebula (Karen Gillan) to a terrorist member of the Kree race, Ronan the Accuser (Lee Pace)—a man determined to exterminate the people of the planet Xandar after what he perceives to be an unjust treaty with the Kree after years of conflict (he’s pretty humorless and typical, but makes a good foil to the zany heroes). Finally rounding out the crew is Drax (Dave Bautista), an extremely literal alien with super strength who’s on an unyielding quest for vengeance against Ronan. 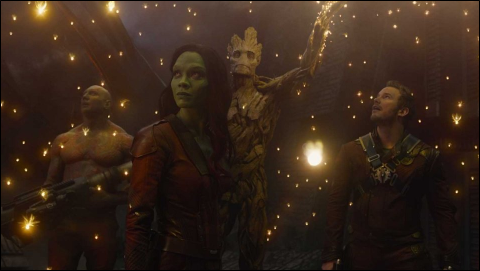 Can Quill, Rocket, Groot, Gamora, and Drax come together as one to defend the galaxy as its guardians? Well, yes, albeit inexplicably. As one could probably gather by the plot and character summary alone, this movie is weird by mainstream blockbuster standards. These unique oddities are part of why I was more excited for this film as opposed to other standard Marvel fair; and in quite a few prospects, it didn’t disappoint. The film is full of exotic alien races (including those that are just discolored human actors, but there’s a charm to that), and the world-building is done well, as we’re also exposed to neat foreign environments and the barebones of the cultures therein. All of this is done with notably pleasing visuals. The colors are vibrant and the effects are great. While I didn’t see it so either of the times I saw the film, I imagine this movie would be a blast in 3D—multiple scenes pop in ways that make it evident that that’s how they were intended to be seen. Like every other Marvel film thus far, this movie is full of comedic moments. This movie was promoted as such, of course, and it never takes itself too seriously without breaking the tension with a funny quip or a musical number. The tonal shifts rarely become too jarring since you can tell what you’re in for (as opposed to previous movies like Iron Man 2 or Thor 2), but there are occasional scenes where the shift is too abrupt for its own good—namely in one scene vital to Rocket’s characterization; which brings me to another point: the characters—more specifically, the main characters and their relationships with one another: I don’t buy it. The film is pretty quickly paced, taking you from venue to venue, from action set piece to piece, with the gang cracking jokes along the way. The problem with that is that by the film’s conclusion, when the gang is finally united and a family of sorts, you don’t really feel it. One scene they’re at each others’ throats, the next, they’re a family ready to lay their lives on the line for one another. And this is a relatively big problem for a film where they’re ultimately the crux of the story. The characters are defined enough to be fun and invoke empathy, but not enough (for some of them) to be truly engaging and natural. Guardians is a fun time, and definitely a good movie. The characters, while, as I mentioned, aren’t very fleshed out to their true potential, are entertaining. The score is great with multiple classic hits; the action set pieces are neat, and they’re great to look at; and the movie plays with many tropes popular in the genre—but not enough. The movie wants to have its cake by subverting/mocking clichés, and eat it too by indulging in them afterwards. This makes the movie a good experience, but not one that really stands out from the rest of Marvel’s filmography once the superficial stuff is set aside.